The 16-foot-high structure is built with "60 sheets of plywood and 1,000 board feet of trim" then it's covered with gingerbread and frosting to celebrate the holiday season. 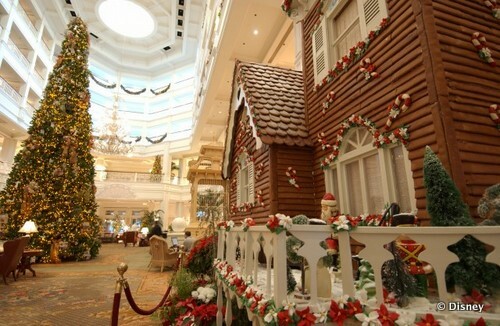 Cast members spend more 400 hours "baking over 10,000 pieces of gingerbread before opening. " Every year, this sweet construction project uses over "1,050 pounds of honey, 600 pounds of powdered sugar and 140 pints of egg whites" to complete the magnificent display. In 2010 they imaginative chefs even included a chimney on the piece that released puffs of "cinnamon smoke" every few minutes. Do you wonder how they do it? Check out this time-lapse video of the construction! The giant gingerbread house isn't just for display though, it's front side is the backdrop for fantastic culinary demonstrations where you can learn to construct and decorate your own gingerbread masterpieces. Around the back you will find the house is actually a gift shop where you can buy, gingerbread house shingles covered with chocolate, gingerbread houses and ornaments, peppermint bark, chocolate boxes, and so much more. Open Daily 10am -10pm the friendly cast members are more than happy to help you pick out holiday treats for your whole family to enjoy. Gingerbread is one of my favorite holiday treats and I look forward to it all year long. Have you stopped by this magical shop to pick up goodies for your family? Leave a comment below and let me know! If you would like to bring that taste of the Disney Holiday's home for yourself, here's a link where you can find the Grand Floridian's very own gingerbread recipe to bake any time of year.